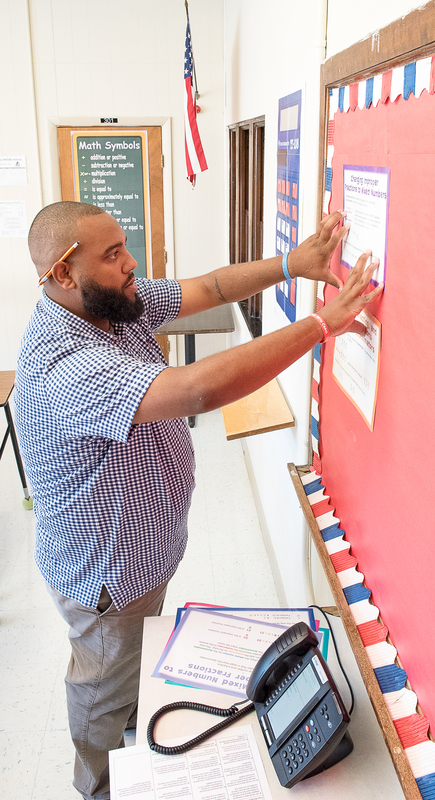 Lewiston Middle School eighth grade math teacher Spencer Emerson gets his room ready Monday morning for the first day of school later this week. His room, like every other in the school, is equipped with a hard-wired telephone as a result of a new cellphone policy enacted this year. The rule will be strictly enforced, Principal Jana Mates said. If students need to call mom or dad, they can — on a new landline installed in every classroom. “Social media is consuming kids,” Mates said, and has become almost addictive. “We can’t control what’s happening,” she said, but the school will try to diminish it during the school day. The stricter enforcement will mean that the first time a student is caught using a cellphone, the student will be given a verbal warning, Mates said. The second time, the phone will be taken away for the day. On the third offense, the phone will be taken away and parents will be asked to come and pick it up. Students will have school laptops, which filter social media posting, Mates said. According to administrators, the goal is to help students focus on learning and create a better school climate. In November, Jayden Cho-Sargent, 13, was killed when he was struck by a motor vehicle while he was walking to the middle school. In May, 13-year-old Anie Graham committed suicide at her home. After the deaths — especially Graham’s — students and community members wrote all kinds of things on social media, some downright nasty, that often didn’t help or clarify what happened, Superintendent Bill Webster said. The School Department discovered “an overwhelming misuse of social media during school hours” at the middle school, Mates said. Educators recognize that many students at that age lack the maturity to resist responding to posts, sharing raw emotions, and/or repeating or making statements that are not correct, which can make a grieving atmosphere worse, she said. Students at the high school largely use social media constructively to help them understand concepts, said Langlais, who now is principal of Lewiston High School. Students there will be allowed to use their cellphones while changing classes, during lunch and in class when they have the teacher’s permission, Langlais said. But high school students this year will no longer be able to wear headphones when changing classes, he said, adding that it’s distracting and inhibits normal communication. Some middle school parents may not be happy about the ban, Webster said. Mates said she hopes the added structure will result in less distraction and will relieve negative peer pressure. “Sometimes kids need permission to be kids,” she said. Another change, Webster said, will be an online app for students, parents and teachers to report bullying, which will be rolled out in the next few weeks as laptops are issued. The district is working on a guide for staff and parents on social media, which will be released soon. A new early-morning routine for students on Mondays and Fridays called “Connections” will involve homeroom teachers sitting and talking, eye to eye, with students about how they are doing socially and emotionally, Mates said. “The idea is to check in and connect with kids,” she said. 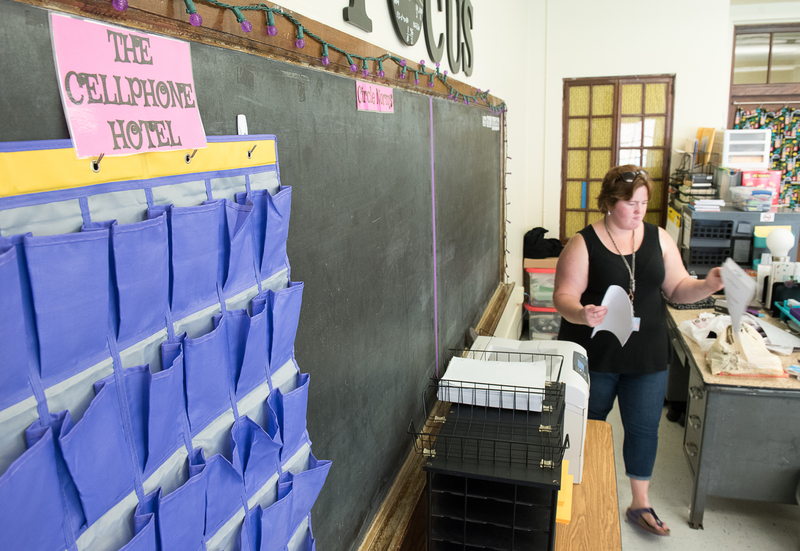 Lewiston Middle School seventh grade math teacher Anne Lasher gets her room ready for classes Monday morning. She is glad the school instituted a consistent cellphone policy this year. Last year, she came up with a “cellphone hotel” where students checked in their phone during class and retrieved it when they left. 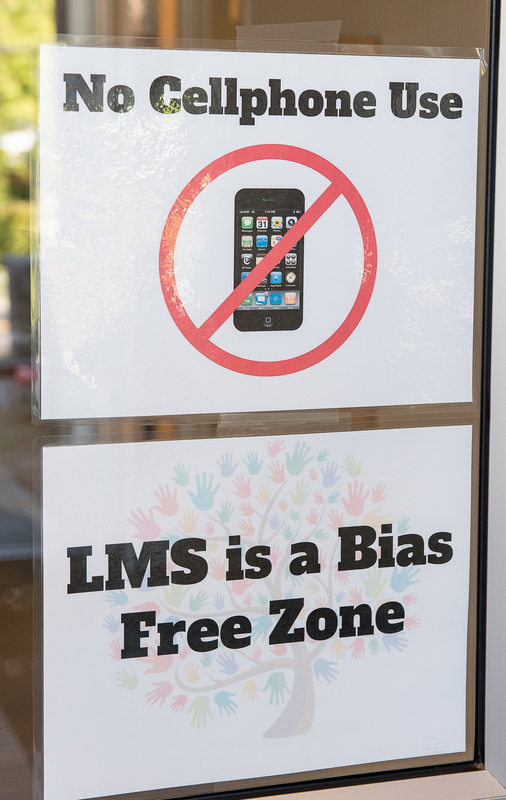 Signs posted on every outside door at Lewiston Middle School announce new policies. Parent: How can a school police a cellphone ban? LEWISTON — Heidi Sawyer, a Lewiston parent and founder of the social media site Lewiston Rocks, offered a mixed reaction to the Lewiston Middle School cellphone ban. “It’s a good attempt to try to mitigate problems, but at the same point policing it seems nearly impossible,” unless the school physically doesn’t allow students to bring cellphones in the building, Sawyer said. Taking away the tool may not change the behavior, she said. A more effective way may be to do more restorative practices in school. Another responsibility lies with adults in the community, parents, siblings and politicians, to model good social media behavior to youngsters. Adults in school and out of school should have frank discussions with students using examples of good and bad postings to address deeper problems, Sawyer said. And while social media does generate hatred and anger, it also promotes caring and help. Lewiston Rocks has gathered people to pay for public swimming pool time and to help families in need, Sawyer said.